Welcome to the workshop, keep it clean! We are building an online educational experience that is fun, engaging and most importantly provides real world information on how natural materials can be used in construction today. Members will gain access to online instructional videos, reference documents and materials briefs as well as being given the chance to request or contribute specific content. International building codes are changing for the better and we'll be here to help you understand and use them! Whether you are building a straw bale home in California or working on a Bamboo school in Cambodia, we'll be here creating content you can use to help you're projects go smoothly. We bring years of experience constructing buildings using natural materials. 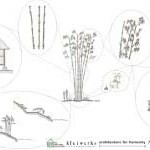 From review of international buildings codes for earth, straw and bamboo to community construction and technology sharing projects in countries around the world. We welcome comments and will be creating avenues for you to create and upload peer reviewed content soon. In the mean time feel free to check in from time to time and see what we are up to.